Players need to be level 70+ to enter these Dungeons. Each Dungeon has 6 places, which each place having 10 stages. 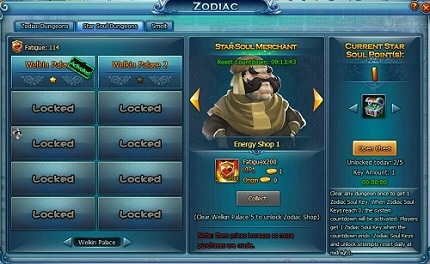 Clearing these Dungeons consumes fatigue which can be restored at the Star Soul Shop. Inside these Dungeons there will be chests, which require different Star Soul points along with Zodiac Soul keys to open. Players can also smelt Star Soul Orbs here, which is useful as players can use Star Soul Orbs to socket them into their equipment. Each Piece of Equipment can be socketed with up to three different Star Soul Orbs.